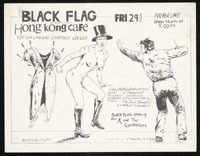 Early and exceedingly scarce original offset litho June 1979 BF flier where Pettibon began numbering the series (#7). Some light tape pulls on backside and a piece of Scotch tape. Overall nice shape! November 1979 all-star line-up at the legendary Hong Kong. 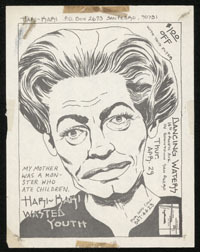 Flier #18 from Pettibon... and so the bids to attract police attention begin ramping up! Some wear-n-tear and light staining to upper right corner. Price reduced accordingly. 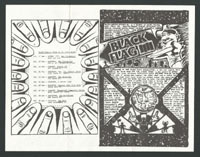 Straight from the files of legendary SF promoter, Dirk Dirksen: a Keith-era show-stopper for Black Flag's first trip to San Francisco in October 1979. 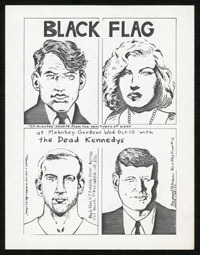 Four Pettibon panels honoring the Dead Kennedys who shared the bill. 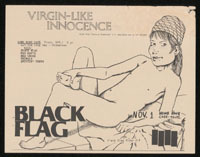 Original photocopy process with Pettibon's stylized handwritten band logo and sequenced as "Black Flag flyer #16". As with #17, both offset and photocopy originals exist. The SLA strikes again thanks to St. Pettibone. 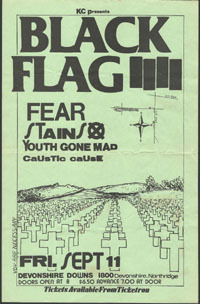 Original offset litho October 19, 1980 flier for a Flag appearance in San Francisco. Pinholes in two corners with some light smudging to left side. The "Creepy Crawl" hits SF again, this time on Halloween 1980 with some good Bay Area bands including KBD legends, the Nubs. Original offset litho on yellow stock. 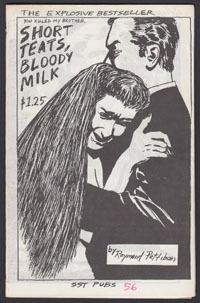 Once again, newspaper clippings alongside classically creepy Pettibon art. Pinholes in upper corners and a small stain at lower right. 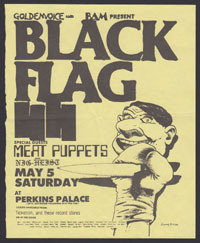 The graphic that would be used a couple years later for their double-LP compilation graces this September 1980 flier. Original offset litho in excellent condition with only minor wear to edge. 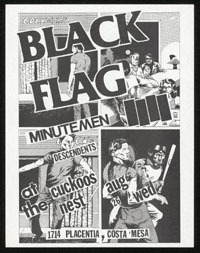 Rollins' second gig in August 1981, again at the legendary Cuckoo's Nest with a top-notch Pettibon to mark the occasion. Beautiful condition, too! 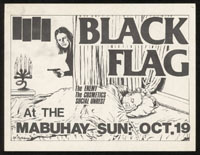 One of a couple Pettibon designs used for this September 1981 show in Northridge. Original offset litho flier on tan stock. Addressed and postmarked on reverse (see pic). 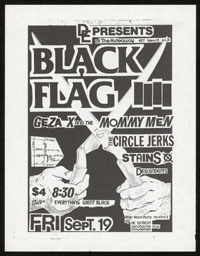 One of a couple Pettibon designs used for this September 1981 show in Northridge. Large format original offset litho flier on green 11" x 17" stock. Folded four times but stored flat. 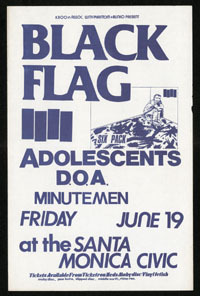 Blue variant huge line-up for this June 1981 gig at the Santa Monic Civic. Original offset litho on ledger size 11" x 17" stock. Minor chipping to right side. Stored rolled and in excellent condition. BF takes SF for a Halloween creepy crawl! Pettibon provides flourish with a naked, erect trapeze artist. 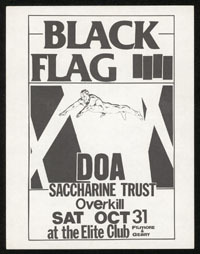 Original offset litho flier for this gig on October 31, 1981. Excellent condition. BF takes SF for a Halloween creepy crawl! Pettibon provides flourish with a naked, erect trapeze artist. 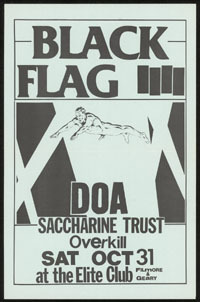 Original offset litho flier for this gig on October 31, 1981. This is the scarce 11" x 17" version on light blue paper stock. Folded twice but stored flat so creases are hardly visible. 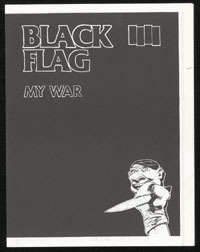 Though reproduced many times, an original of this non-Black Flag Pettibon is super tough to find. 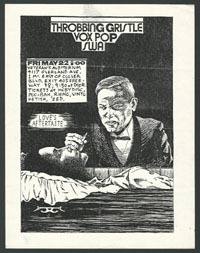 Original photocopy process flier for this May 22, 1981 gig, one of only two TG stops on this tour. Folded three times but stored flat. Old tape residue on back corners and tape-pull type tear on back at upper center. 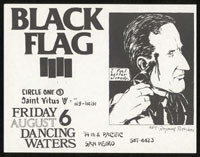 Original offset litho flier for this August 1982 gig in Pedro. Folded twice, stapled and stamped with SST return address but never mailed (see pic). A real beauty. 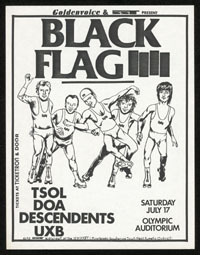 Olympic Auditorium was known for being hosting many a rollerderby event, so Pettibon dressed the BF crew appropriately. Apparently Brother Greg was not amused. Unquestionably authentic, original photocopy process from July 17, 1982. There are four or five variants of this flier including the more common offset version of this one. Half-size (8½ x 5½) for two August 14, 1982 sets at the Whisky-A-Go-Go. Tip-top condition! San Pedro gig alongside Wasted Youth featuring the same Pettibon artwork found on the Red Cross Born Innocent B-side label. April 1982 original offset litho has old tape stains along edges and some creasing. Circa 1984 promo flat for the original Slip It In LP release. Full-color offset litho on coated stock. Backside is blank. 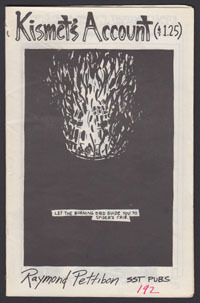 Mail-order-only lyric booklet from 1984 featuring three full pages of Pettibon art (see pics). Excellent condition. 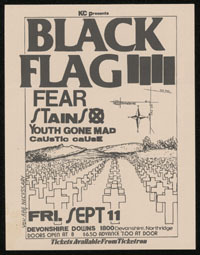 Original 11" x 17" flier for a November 1984 stop in Austin, Texas. General wear-n-tear. Half-legal(7" x 8½") original offset litho flier for a show with Nig Heist and Meat Puppets. Rough edge on left side (the ol' table-edge-as-scissors move by the band). Folded twice but stored flat. 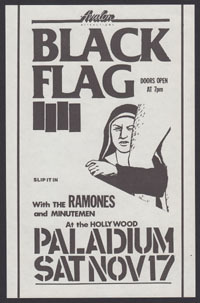 Half-size (8½ x 5½) original offset litho flier with Ramones second-billed (at least with Dukowski's making the flier) and the Minutemen on board. November 1984 sets at the Whisky-A-Go-Go. Tip-top condition! 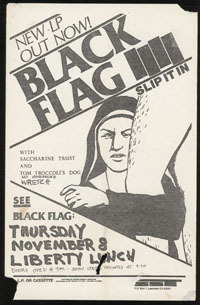 Double-sided Fall 1984 newsletter with Pettibon art and plans for the Slip It In tour. 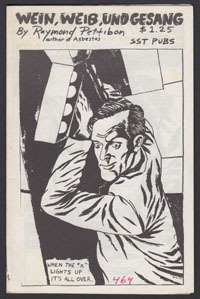 Original offset litho, folded twice. 4-page SST catalog announcing the release of Loose Nut. See pic! Have a look at all the stuff you should've bought. Folded twice with some rumpling. Where it all began! 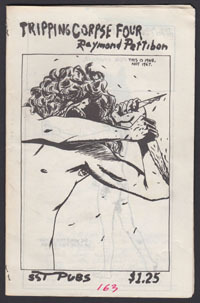 This is Pettibon's November 1978 self-published debut. 68 pages in all. 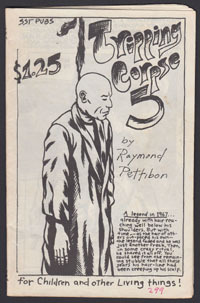 This is the only publication that shows the early spelling of his pseudonym ("Pettibone") along with a copyright credit to his actual name, Raymond Ginn. 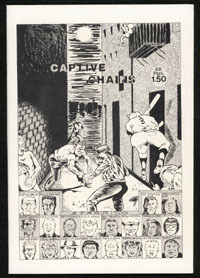 Captive Chains contains page after page of exclusive sequences and panels and is the cornerstone for any Pettibon collection worth its salt. Excellent condition. 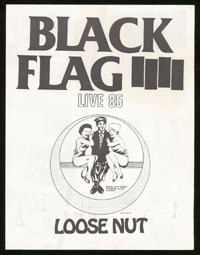 Original March 1985 offset litho SST publication. Some light foxing and chipping along top edge toward spine. Numbered 56 in red ink by the artist. 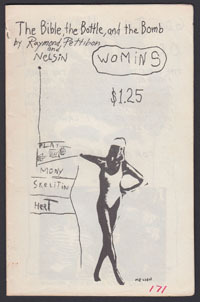 Another twisted Pettibon chapbook, this one from March 1985. Original offset litho, numbered 65 in red ink by the artist. I recognize one page from an issue of Forced Exposure which was also published around this time. Light oxidation to staples. 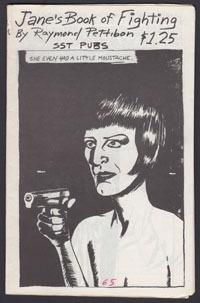 Another installment from the prolific Pettibon, this one from August 1984. Original offset litho, numbered 192 in red ink by the artist. Another title from a particularly prolific Pettibon period in March 1985. Numbered by the artist in red ink: #56. Some oxidation to staples. September 1984 original offset litho SST chapbook. 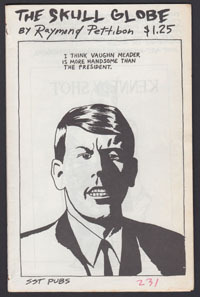 This one's a shared effort between Pettibon and his nephew "Nelson Tarpenny" who, like so many family members before him, would eventually become estranged from Uncle Ray. Light foxing to top edge and spine. Numbered 171 in red ink by Pettibon. April 1985 installment, heavy on the swastikas and US presidents. Numbered by Pettibon in red ink. Light oxidation to staples. Another installment of the Tripping Corpse series, this one from August 1984. One page used for the Minutemen's My First Bells compilation and another as the cover of Sonic Youth's "(Over)Kill Your Idols" 7in. Numbered 163 in red ink by the artist.The upper right corners of the last two pages have some light moisture buckling. Another installment of the Tripping Corpse series, this one from August 1984. 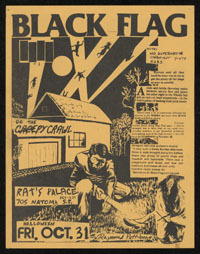 One page recognizable as art used for a Black Flag flier. Numbered 299 in red ink by the artist. Pettibon's March 1985 homage to Johann Strauss. Numbered 464 in red ink by the artist.